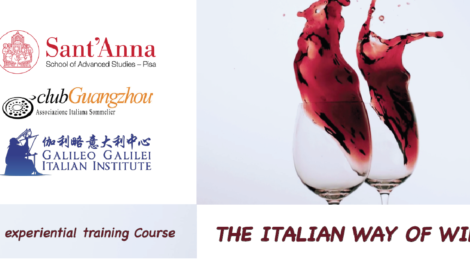 Professionally oriented Course organized by the Italian Public University Sant’Anna School of Advanced Studies of Pisa in partnership with the Club AIS China (Italian Sommeliere Association) of Guangzhou and Galileo Galilei Institute based at Chongqing University. The aim of the Course is to provide knowledge and competence about the Italian wines and the Italian wine culture, art and life style, to illustrate the traditions and history of Italian viticulture and the wine making techniques, to describe the richness and diversity of grapes and wine types and the regional diversity, and to teach and practice the sensorial analysis with practical experience with selected Italian wines. Special focus will be addressed towards specific issues such as wine and health, pairing food (Chinese and Italian) and wine. The methodology is characterized by a combination of theory and practice: multidisciplinary, diverse and innovative didactic activities (virtual tours). FIRST EDITION: CHENGDU 2019 from June 20th to June 30th, 2 weekend (Thursday-Sunday), 6 hrs per day, for a total of 48 hours. The Course syllabus is structured as follows: a classroom training phase from 10 am to 5 pm, frontal lessons (with a one-hour lunch break). The languages of the Course are Chinese, English or Italian (both with Chinese translation). At the end of the Course the University Sant’Anna School of Advanced Studies and Club AIS China will issue a CERTIFICATE OF ATTENDANCE.